Hi! Welcome to our piano tutorial on how to play Amazing Grace using chords. This song is very popular across the world and has been written in different languages. Amazing Grace was written by an English poet name John Newton and published in 1779. Since then, it is being sung by many religious Christian groups who use it as a tradition hymn. However, this page is not about the history of the song amazing grace so let us move on. Visit Wikipedia.com for more information on the history of Amazing Grace. 1) You will learn to play basic chords such as major, minor, 7th etc. 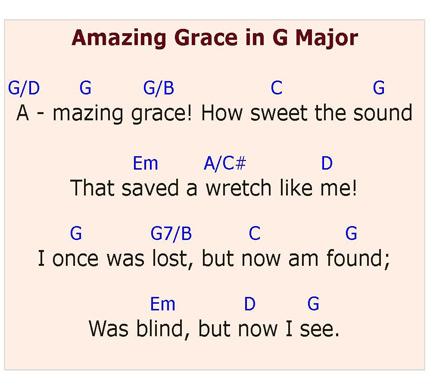 2) You will be able to use these chords to play the song “Amazing Grace”. 3) You will be able to play the song amazing grace in the key of C and G major. It is very important that you know melody of the song, as it will give you the advantage of learning play it quickly. 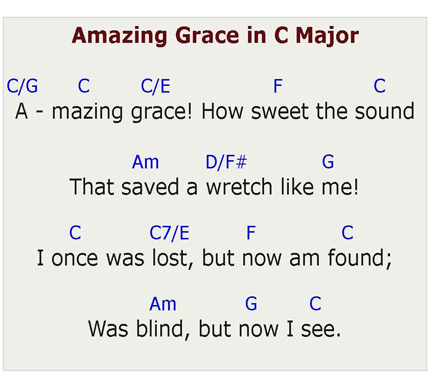 Here is an illustration as to how you can play the song “Amazing Grace” in the Key of C major. You can use the chord chart at the bottom of this page to help you. You should notice that the illustrations only focus on the chorus of the song. But the chord progressions used in the chorus above can be used for all the verses since the melody of the verses and chorus have the same melodic structure. How to play Amazing Grace in the key of G major. Below are illustrations of the chords used to play the song in both C and G major. I am sure that you will find them to be very useful. Practice to play each chord on your piano properly first, and then use them to help you play the song. Click here to leave How to play Amazing Grace and return to home page.